We’ve already touched on how “Obama” sounds frighteningly close to “Osama” and how his middle name is “Hussein”, but we think this latest link can not be ignored. How could any patriotic American not be concerned about the similarity of the names “Barack” and “Baraka”. 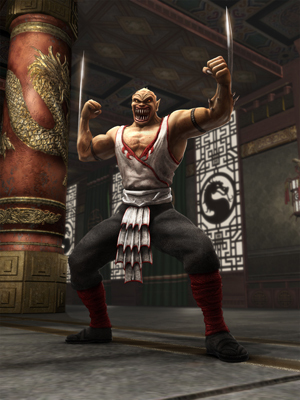 For those who do not know, “Baraka” was a monstrous enemy in the popular and exceedingly violent video game, “Mortal Kombat”. As you can see in this photo, he had a demonic, clearly anti-Christian visage and two deadly metal swords in his forearms. The only logical conclusion to the parallels between these two entities is that if we let Barack Obama into the Oval Office, he will most likely perform a “fatality” on this country. If you support Obama, then you are obviously a freedom-hating demon lover who wants to see America have its skull and spine ripped out in one fluid motion and then mockingly shown to its own momentarily standing body. This entry was posted by Heath on February 21, 2007 at 11:52 pm, and is filed under Flotsam and Jetsam, Opinions and Facts. Follow any responses to this post through RSS 2.0. You can leave a response or trackback from your own site. Just a technical thing here – when I scroll far enough down, the text of this entry disappears. Also – I really hope not. I have a soft spot for Obama. Don’t blame me, I’m voting for Sub-Zero!